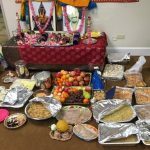 GOD chapter of Chicago celebrated Janmashtami in a grand manner from Aug 25th through Aug 28th. The satsang commenced on Aug 25th evening with Mahamantra kirtan followed by Nandotsav, Parayanam on Srimad Bhagavatham and the celebrations ended with a discourse by Sri Ramaswamy ji from California, a disciple of His Holiness Sri Sri Muralidhara Swamiji. 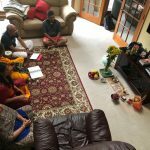 On Aug 26th evening, Sri Ramaswamy ji delivered a lecture on Krishna Lila at the Hindu Temple of Greater Chicago in Lemont. Around 30 people enjoyed the talk. 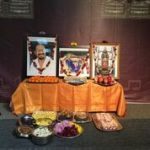 On Aug 27th, Akanda Nama was held in the residence of Sri Zivan Prakash and Smt. 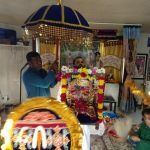 Yamini Zivan from 8:00 am to 6:00 pm, followed by a great talk on the Glory of Nama Sankirtan by Sri Ramaswamy ji. About 5 families joined the chanting of the Mahamantra throughout the day. 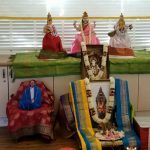 On Sunday, Aug 28th all the satsang kids gathered for a unique session of Gopa Kuteeram followed by a grand Rukmini Kalyanam and Hanumath Pooja. 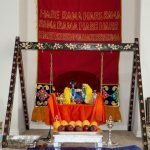 The utsav ended with Mahamantra chanting and Maha prasad.